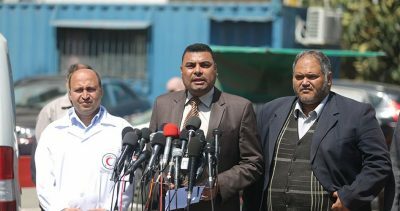 Gaza’s Ministry of Health on Saturday warned that it is suffering from an unprecedented medical deficit. Spokesman for the Ministry Ashraf al-Qedra said that the Ministry is facing the biggest drug shortage in 11 years after Gaza hospitals and medical centers have run out of 50% of essential drugs and medical supplies especially those related to emergencies. Al-Qedra explained that this is the result of the Israeli violent targeting of peaceful protesters in the Great March of Return. So far 46 Palestinians have been killed and over 7,000 injured, some of whom seriously, after being deliberately targeted by Israeli gunfire while taking part in the Great March of Return near Gaza’s eastern border.